A great improvement in the Sea Front road was made in 1878, when the old 'oaths were removed. Previous to that time, there was only a road for pedestrians in front of the baths, the carriage road at that point running behind the bathing establishments, which were wooden structures. A small oval shrubbery occupied the space in front of Camden Crescent. When the baths were removed, and the Sea Fromt road carried over where they had stood, the space occupied by the old road and shrubbery was laid out as the Granville Gardens, the refreshment rooms and the old Granville Hall being built at the same time. Accommodation for the Proprietary Library was added in 1888, after the fire which destroyed the Library premises in Castle Street on the 5th of January, 1888. Twenty years later the library the widening of the Sea Front road and promenades, in was dispersed. A still greater improvement was made by 1894. In this work, the Dover Harbour Board co-operated with the Town Council, the Board re-building the sea wail further seaward, opposite the Marine Parade. The Granville Gardens were used from the beginning for military band concerts arranged by a committee supported by public subscriptions, but towards the close of the 19th Century the Town Council leased the gardens and took over control of the band performances, which were a great attraction. The Pavilion was not built until 1925. With the onset of the Hitler war the garden concerts ceased. Prominent features of the Marine Parade area before the Hitler war, in addition to Granville Gardens, were the lofty Burlington and Grand Hotels, the Royal Cinque Ports Yacht Club and the Corporation’s indoor swimming baths next to Marine Court. In addition to Granville Gardens there were, interspersed between the Marine Parade residences, two further amenity areas, known as Guilford Lawn and Clarence Lawn. It was m the centre of Clarence Lawn that a bust was erected to the memory of Captain Matthew Webb, the first person to swim the English Channel. He completed that epic swim on 24-25 August 1875. It is estimated that he swam over 60 miles fighting against tides and currents, the swim taking 21¾ hours. “The said Captain Matthew Webb did not receive any aid or support whatsoever in the accomplishment of his swim, except that refreshments were given to him while he was in the water, but without his touching a boat or any other thing for support.“ At least three others signed similar declarations. Captain Webb’s pilot was the lugger skipper, Captain George Toms, who lived in Park Street. He died on 20 August, 1900, almost 25 years to the day, after the swim was made. That he piloted Capt. Webb is recorded on his tombstone in St Mary’s Cemetery. The work of sculptor Mr F. W. Doyle Jones, the bust of Captain Webb was paid for by public subscription, a fund for the memorial being launched by Mr Alfred Jonas, of the Channel Swimming Association. The bust was unveiled by Lord Desborough, on 8 June 1910. Visitors staying at the Burlington Hotel could look out across Clarence Lawn and the Captain Webb memorial and watch shipping movements in the harbour. On the centre of Guilford Lawn was the statue of another famous pioneer, the Hon. Charles S. Rolls, one of the two men who founded the world-renowned Rolls Royce Company. One of the aviation pioneers, he became the first pilot to make a return flight across the Channel, from the cliffs east of Dover to France and back, non-stop. Achieving an average speed of only 30 mph he made the flight on 2 June 1910—just under a year after the first solo flight across the Dover Strait by Louis Bleriot, on 25 July 1909. The Rolls memorial was unveiled by the Duke of Argyll, in 1911. During the Hitler war the Webb and Rolls memorials were removed to a place of safety and afterwards were found a new home on the Promenade. Bleriot’s historic flight was marked by the laying of a granite pavement, in the shape of an aeroplane, in the turf of Northfall Meadow, behind the Castle, where Bleriot’s frail little craft came to rest after the flight. 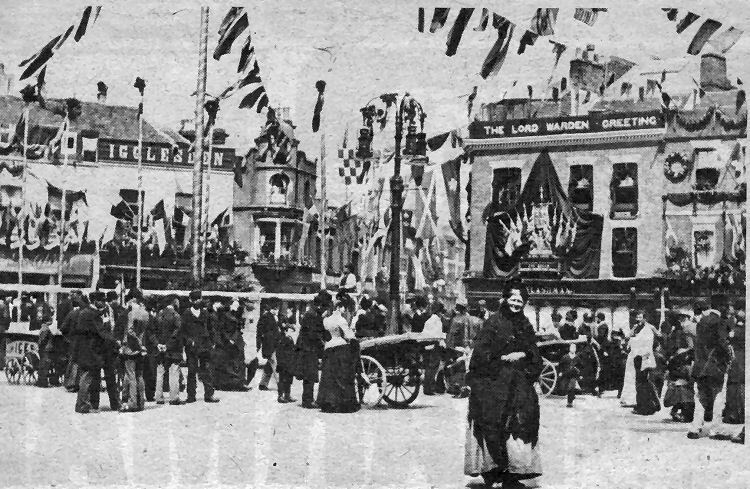 Yards and yards of bunting supported by candy-striped flagpoles present a colourful scene in a busy Market Square as Dover prepared to greet a Lord Warden on his visit to Dover some time before the Corporation Tramway system was opened in 1879. Businessmen vied with each other to see who could put on the most lavish display. FIashman’s furniture store on the right even had elaborate coloured drapes at each of the first and second floor windows together with an array of royal standards set against a suitably dropped backcloth. The ice cream man was there with his four-wheeled handcart and below the gas lamp are two other carts. These and the mode of dress of some of the menfolk suggest that it could have been market day. On the corner of Church Street and Castle Street, (centre) is Packham's livery and bait stables. Mr E. Packham was a posting master by appointment to Prince Arthur, operating fashionable breaks, open carriages, horse-buses, hiring out horses and also provided riding lessons. In the late 1890s the business was taken over by Mr T. W. C. Laslett. The picture, above, depicts a leisurely scene at Granville Gardens during a military band concert in the 1920s.